Simply brilliant from start to finish. This little bargain deserves to sell by the bucket-load. Up to eight completely independent synth engines. Amazing value for money. Standalone but software- and MIDI-controllable. Hardware control knob functionality is fixed. Use Audio has kept the controls on the Plugiator hardware pretty simple. Creamware was one of the first companies to put hardware synths into software with its Scope system. In what some might describe as an unusual step, the same company then built hardware units that were powered by some of their software engines and called them ASB modules. Sadly, Creamware folded in early 2007 and rights to its technology were equally split between SonicCore, which continues to develop Scope products and Use Audio, which has picked up the ASB technology to develop new products. The first of these is Plugiator. 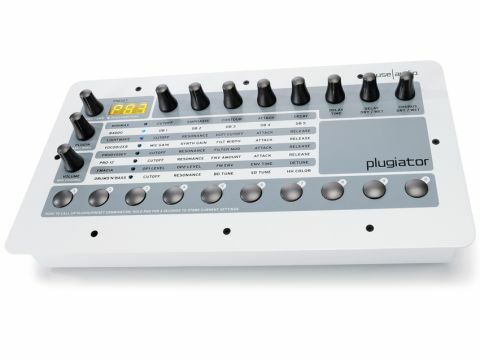 The Plugiator is a hardware/software synth hybrid which brings eight separate sound engines, many taken from the ASB range, and brings them together under one roof for the first time. It comes in a cream and grey livery, with the front panel featuring a row of knobs, another of buttons and a 'matrix' of parameters. At the top is a basic LED display, which is used to show preset numbers and other parameters as they're being edited. Round the back, you'll find stereo line outs, a headphone out, a mono line-in, USB port and MIDI In/ Thru. There's also an on/ off rocker switch and the power inlet. The unit is designed to stand alone like a regular hardware synth, though its parameters can be edited via the Plug-In Manager software, via any MIDI controller or, in a more limited way, directly from the front panel. Each synth engine can have five of its most crucial parameters tweaked by knobs at the top, while the other three dials access delay and chorus settings, which each engine can use. The function of each of the control knobs is fixed, unfortunately, though as you can edit as many parameters as you like over MIDI or via the Plug-In Manager, this isn't too great a hardship. So, now to those synth engines. Three of these are contained within the box as you buy it over the counter - the MiniMax, B4000 and the LightWave. Additional modules for the Prodyssey, Pro-12, FMagia and a forthcoming Drums'N'Bass instrument can be purchased separately via Use Audio's website. Once you've done this, they're 'transferred' to the hardware unit via USB and operate just like the default banks. An additional bank, Vocodizer, is also free but can only be downloaded once you're registered as part of Use Audio's online community. Ten 'favourite' locations can be recalled from the buttons at the bottom, with these loading both a particular sound and the relevant instrument at the touch of a button. The other half of Plugiator is its software brain, which is compatible with both Mac and PC. Once installed, the Plug-In Manager acts as a control surface, providing an editable GUI for whichever synth engine is currently active. The Manager squeezes a lot into one window, with a group of three windows on the left and the main screen to the right serving as the principal control areas. To start editing a sound, you first need to select the relevant instrument in the top box. In the main screen, the plug-in's GUI then loads, while a list of preset sounds for that instrument is provided above. As Plugiator is exclusively a DSP synth which doesn't rely on samples, the only thing that changes from one patch to another is the position of the MIDI control knobs. So, patch changing is immediate and switching synth engines takes no more than a couple of seconds. As you'd expect, the hardware unit keeps pace with your selections and a bright blue LED next to each engine keeps you in touch with whichever instrument you're editing. Back in the software, you can audition sounds by clicking on the small 3-octave virtual keyboard on the left and keep tabs on MIDI control numbers in the bottom left-hand corner. Rather brilliantly, the moment you touch a dial, this little screen positively oozes relevant control change numbers, which makes setting up and assigning hardware sliders a doddle. Normally, it's a relatively simple task to find the right adjectives to describe the sound of any given synthesizer, as each tends to have a character of its own. However, Plugiator contains eight completely separate instruments in its fully expanded form. Anyone who has heard the Creamware ASB boxes should know what to expect, as Plugiator contains the same DSP. Rather than boring you with eight sets of adjectives, we will simply say that each unit sparkles and that the richness of the instruments emulated is extremely impressive. Plugiator contains brand new presets (not those from the ASB hardware boxes) and these do a great job of showing off each engine. The newcomer, the FMagia, is a bright, crisp FM synth which does a decent job of emulating the DX7 in all its rich, harmonic glory. The Plugiator can store 800 presets, which works out at 100 per plug-in. However, if you only decide to go with the four native engines and don't expand, you can still use all of these locations, writing 200 presets for each if you like. Presets can be written and captured in both directions via USB, with changes made on the unit 'uploadable' to the Plug-In Manager and vice-versa. Plugiator is brilliant in more ways than we can adequately describe. For a start, even if you choose not to expand, you've got the sounds of three separate synths and a wonderful vocoder available for a fraction of the cost of the ASB technology from which they are derived. For a little extra outlay, you can turn Plugiator into an 8-engine monster, with the promise of further synth titles a tantalising prospect. Use Audio hopes to make the system truly modular - with, for instance, the option to run MiniMax's oscillator's through the Pro-12 filter - so we could be in for even more thrills in the future. If you thought that software instruments were the only economically viable way for you to expand your sound, think again. The synth world just became a much more interesting place.